The W25014B9 is Cartier's Panthere X series model for men. This wristwatch is a gorgeous statement of luxury and sophistication. This Swiss made Cartier watch features an elegant scratch-resistant sapphire dial window and octagonal crown set with the blue sapphire cabochon. This watch also comes with a sword shaped blued steel hands and a bracelet fit up to 7" wrist with hidden deployment clasp. Its handsomely crafted 27.53 x 28.2 (37. 85 including the lugs)-millimeter case, fixed bezel secured with 8 pins, and bracelet are featured in a high quality brushed and polished 18k yellow gold. In addition, the W25014B9 model wristwatch's dial has a silvered grained dial, a date calendar at 3 o'clock aperture, and a secret Cartier signature at VII. There are Painted black roman numerals that revolve around the 18k yellow gold fixed bezel. The watch features a precise, Quartz movement. 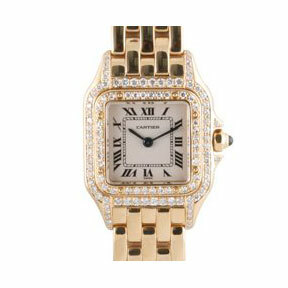 In case you'd like to order yours, just saying, this Cartier Panthere X's original price is $9,500. You can find an original Cartier W25014B9 Watch at the site(s) listed above. However, we don’t guarantee its availability as being listed here simply means that those site(s) has the item in question by the time we wrote the review. The review in this page is written by garnish at Monday, April 02, 2012. The post is tagged as analog, cartier, men, quartz, watch, yellow gold.